TCR Id protein conjugated to keyhole limpet hemocyanin (KLH) (TCR Id:KLH) and injected with a chemical adjuvant (QS-21) induces a protective, Id-specific immune response against the murine T cell lymphoma, C6VL. However, Id-based immunotherapy of C6VL has not demonstrated therapeutic efficacy in tumor-bearing mice. We report here that C6VL lysate-pulsed dendritic cells (C6VL-DC) vaccines display enhanced efficacy in both the prevention and the therapy of T cell lymphoma compared with TCR Id:KLH with QS-21 vaccines. C6VL-DC vaccines stimulated potent tumor-specific immunity that protected mice against lethal challenge with C6VL and significantly enhanced the survival of tumor-bearing mice. Tumor-specific proliferation and secretion of IFN-γ indicative of a Th1-type immune response were observed upon ex vivo stimulation of vaccine-primed lymph node cells. Adoptive transfer of immune T cell-enriched lymphocytes was sufficient to protect naive recipients from lethal tumor challenge. Furthermore, CD8+ T cells were absolutely required for tumor protection. Although C6VL-DC and control vaccines stimulated low levels of tumor-specific Ab production in mice, Ab levels did not correlate with the protective ability of the vaccine. Thus, tumor cell lysate-pulsed DC vaccines appear to be an effective approach to generate potent T cell-mediated immune responses against T cell malignancies without requiring identification of tumor-specific Ags or patient-specific Id protein expression. Tcell malignancies are diverse in their composition, aggressiveness, and response to treatment. Despite modern therapies, including radiation, chemotherapy, and bone marrow transplants, most patients with T cell cancers remain incurable due to disease recurrence (1). Immunotherapeutic approaches to treat lymphoma patients once they attain a state of minimal residual disease may reduce or delay recurrence and enhance survival (2). To date, efforts to develop immunotherapy for B and T cell lymphomas have largely focused on the use of tumor-derived idiotype protein as a source of defined tumor-specific epitopes. Id proteins expressed on B cell lymphomas have been exploited in numerous murine models (3, 4, 5, 6, 7) as tumor-specific targets for the development of tumor immunotherapy and have also been associated with enhanced clinical outcome (8, 9). For the development of immunotherapeutic approaches for T cell lymphoma, the studies have been far fewer in number, but have also concentrated on using tumor-derived Id epitopes to generate anti-tumor immunity. Okada and colleagues (10, 11) demonstrated that vaccination with tumor-derived TCR Id protein generated an effective anti-tumor response against a murine T cell lymphoma, C6VL. Vaccination with recombinant TCR Id protein conjugated to keyhole limpet hemocyanin (KLH)3 and injected with a chemical adjuvant (TCR Id:KLH+QS-21) stimulated both humoral and cellular anti-Id responses in mice. Despite Id-specific Ab production in vaccine recipients, anti-tumor immunity was primarily mediated by CD8+ T cells (10, 11). In subsequent experiments vaccination of mice with adenoviral vectors containing chimeric TCR Id also stimulated CD8+-mediated anti-tumor responses in the C6VL model (12). This approach did not result in enhanced levels of survival compared with vaccination with TCR Id:KLH+QS-21, however. We hypothesized that combining the potent adjuvant potential of dendritic cells (DC) in stimulating cell-mediated immunity against tumors with the ability to target multiple tumor-specific Ags would allow increased efficacy in the immunotherapy of T cell lymphoma compared with TCR Id:KLH+QS-21 vaccines. The use of DC in the development of effective prophylactic and therapeutic vaccines for a variety of cancers has been the focus of intense investigation by many groups. DC have been targeted in this effort largely due to their unique ability to initiate potent primary and secondary immune responses (13) and to control the type of immune response that is induced (14). DC loaded with tumor-derived DNA, RNA, protein(s), or peptides have been used as an efficacious vaccine in multiple murine tumor models (15, 16, 17, 18, 19, 20, 21, 22, 23, 24, 25, 26). DC have also been effective as cellular adjuvants for B cell Id protein vaccines. Loading DC with B cell Id:KLH stimulated levels of anti-tumor immunity superior to Id:KLH injected with a chemical adjuvant (27). In patients, loading DC with B cell Id protein with or without carrier protein (KLH) resulted in the generation of Id-specific cellular immune responses (9, 28, 29) in addition to the largely humoral immune response observed in patients receiving B cell Id vaccines without DC. The ability to target multiple tumor Ags may increase the magnitude and diversity of anti-tumor responses, thus preventing tumor from escaping responses limited in repertoire (30). Loading DC with proteins from tumor cell lysates may result in the presentation of a broader array of tumor-specific Ags than what may be presented using Id protein (31), including multiple epitopes for both CD4+ and CD8+ T cells (32). In addition, tumor cell lysates contain agents known to induce maturation of DC (32). Mature DC have an enhanced capacity to prime potent Ag-specific CTL activity and stimulate IFN-γ release by CD4+ Th cells. Recently, two groups have demonstrated that tumor lysate-specific cytotoxic T lymphocytes can be generated ex vivo against autologous primary multiple myeloma (33) and B cell chronic lymphocytic leukemia (34) tumor samples using tumor lysate-pulsed DC as stimulators. We demonstrate here that tumor lysate-pulsed DC stimulate a potent anti-tumor response against murine T cell lymphoma in vivo. Vaccination of mice with T cell lymphoma-pulsed DC (C6VL-DC) significantly enhanced the survival of tumor-challenged mice compared with the previously reported TCR Id:KLH in QS-21 vaccines. Anti-tumor immunity stimulated by C6VL-DC was lysate specific and required the presence of CD8+ T cells. The vaccines stimulated a potent cellular response that was characterized ex vivo by tumor-specific proliferation and IFN-γ secretion by vaccine-primed lymphocytes. Lastly, C6VL lysate-pulsed DC vaccines significantly enhanced the survival of tumor-bearing mice. This study is the first to directly compare the efficacy of defined protein epitope-based and tumor lysate-pulsed DC-based vaccine approaches for the immunotherapy of lymphomas. Our results demonstrate that tumor lysate-pulsed DC are efficacious in stimulating reactivity against T cell lymphoma that is capable of clearing existing tumor as well as preventing future tumor growth. Tumor lysate-pulsed DC vaccines out-perform the idiotype-based vaccine strategy currently being pursued for the immunotherapy of T cell lymphomas. Female C57BL/6 mice (H-2b) were purchased from The Jackson Laboratory (Bar Harbor, ME) at 6 wk of age. The animals were housed in the Ann Arbor Veteran’s Affairs animal medical unit under specific pathogen-free conditions according to the guidelines drafted in the Animal Component of Research Protocol that is implemented in Veterans Affairs research centers. The mice were between 7 and 9 wk of age when vaccine protocols were initiated. AIM-V serum-free medium (Invitrogen, Carlsbad, CA) was used to derive DC and to generate DC-based vaccines. DC used for in vitro assays and C6VL for tumor challenges were grown in complete medium (CM), consisting of RPMI 1640 supplemented with 10% FCS, 0.1 mM nonessential amino acids, 1 μM sodium pyruvate, 2 mM l-glutamine, 50 μg/ml gentamicin, 100 U/ml penicillin, 0.5 μg/ml Fungizone, and 50 μM 2-ME (35). CD hybridoma serum-free medium (Invitrogen) was used to produce mAbs used in vivo to avoid serum protein contamination of Abs. Murine rGM-CSF (sp. act., ≥5.0 × 106 U/mg) and murine rIL-4 (6.1 × 108 U/mg) were purified from overexpressing cell lines generated in our laboratory; murine rIFN-γ (50 μg/ml; BD PharMingen, San Diego, CA) was used to prepare a standard curve for ELISAs. Human rIL-2 (18.0 × 106 U/mg) was obtained from Chiron (Emeryville, CA). C6VL (H-2b) is a radiation-induced T cell thymoma of the C57BL/Ka background (36). C6VL was used as our tumor model in these studies. C6VL cells have a mature T cell phenotype expressing TCR-αβ, Thy 1.2, CD3, CD4, and H-2Db surface proteins (37). C6VL does not express MHC class II or Fas (10). MBL-2 (H-2b) is a T cell lymphoma cell line of C57BL/6 origin (provided by I. L. Weissman, Stanford, CA) that was used as a control T cell lymphoma lysate and a control tumor challenge. B16/F10 (American Type Culture Collection, Manassas, VA) is a melanoma derived from C57BL/6 mice and was used as a non-lymphoid tumor lysate control. mAb 124-40 (mouse IgG1κ) recognizes a determinant on the C6VL TCR α-chain V region (36). mAb 2.43 (Rat IgG2b) recognizes mouse CD8.2. mAb SFR8-B6 (rat IgG2b) recognizes human HLA-Bw6. The 2.43 hybridoma was purchased from American Type Culture Collection. The SFR8-B6 hybridoma was provided by J. Parnes (Stanford, CA). mAb 124-40 was purified from culture supernatant over a protein A-Sepharose column. 2.43 and SFR8-B6 were purified from serum-free hybridoma culture supernatants by ammonium sulfate precipitation, followed by strong anion exchange chromatography. Ab concentrations were determined by bicinchoninic acid assay (Pierce, Rockford, IL). FITC-labeled anti-CD4 (GK1.5, isotype rat IgG2b,κ), anti-CD80 (16-10A1, hamster IgG), anti-CD86 (GL1, rat IgG2a,κ), anti-CD11c (HL3, hamster IgG), anti-I-Ab (AF6-120.1, mouse IgG2a,κ), anti-CD40 (3/23, rat IgG2a,κ), anti-CD3ε (145-2C11, hamster IgG), and anti-CD19 (1D3, rat IgG2a,κ); PE-labeled anti-CD8b.2 (53-5.8, rat IgG1,κ); and isotype controls were purchased from BD Biosciences (San Diego, CA). PE-labeled anti-CD8b.2 (53-5.8) was used to determine CD8+ T cell depletion in mice and is non-cross-blocking with mAb 2.43. FITC-labeled goat anti-mouse IgG+IgM (H+L) was purchased from Jackson ImmunoResearch Laboratories (West Grove, PA). Purified and biotinylated forms of rat anti-mouse IFN-γ and rat anti-mouse IL-4 mAbs for ELISA were purchased from Caltag (Burlingame, CA). Streptavidin-HRP was purchased from Pierce (Rockford, IL). The C6VL TCR Id protein vaccine was used for comparison with prior experiments. The C6VL TCR Id protein was purified from a recombinant overexpressing cell line. Briefly, DNA constructs of α- and β-chains of the C6VL TCR were modified to contain coding sequences for a thrombin cleavage site, coiled-coil (derived from a leucine zipper protein), and six histidine residues. The DNA constructs were cloned into the expression vector, pSRαSD5 (10) and transfected into BW5147 cells by electroporation. A cell line was isolated that expressed ∼3 mg/L C6VL TCR Id protein in the culture supernatant. The TCR Id protein was purified from the culture supernatant on a 124-40 mAb affinity column and then on a metal affinity column (MAC). The protein was eluted from the MAC with imidazole and then digested with thrombin. After cleaving the coiled-coil/His tag from the TCR Id protein with thrombin, the digest was run over a second MAC, and the TCR Id protein was collected in the flow-through. The TCR Id vaccines were prepared by conjugating the recombinant TCR Id protein to KLH (1:1 ratio, 35 μg TCR Id/vaccine) and then mixing with QS-21 (10 μg/vaccine) for s.c. delivery. Bone marrow cells were flushed from the femurs and tibias of C57BL/6 mice and depleted of erythrocytes using Sigma Red Cell Lysis Buffer (8.3 g/L NH4Cl in 0.01 M Tris-HCl buffer, pH 7.2). The resulting cells were cultured at a density of 1.0 × 106 cells/ml in either CM (Figs. 1⇓ and 2⇓B) or AIM-V serum-free medium (all other experiments) containing 10 ng/ml rGM-CSF and rIL-4. On day 3 of culture, fresh cytokines were added, and the total culture volume was increased by 50% with the addition of fresh medium. After 5 days of culture, nonadherent cells were harvested by gentle pipetting and were suspended in CM or AIM-V to a density of 4.0 × 106 cells/ml. DC were enriched from the nonadherent population by density centrifugation over medium containing 14.5% (w/v) metrizamide (Sigma) (25). The cells at the metrizamide solution/medium interface were washed three times in the respective medium before use. The resulting DC population was analyzed by flow cytometry (FACScan; BD Biosciences, San Jose, CA) for the expression of cell surface markers characteristic of DC. Each preparation was ≥80% positive for the coexpression of MHC II, CD11c, CD40, CD80, and CD86 (data not shown). The cells did not express CD3 or CD19. C6VL-DC vaccines stimulate a superior protective immune response compared with TCR Id vaccines. Groups of 10 mice were vaccinated three times with 1.0 × 106 C6VL-DC, unpulsed DC, TCR Id:KLH+QS-21, or HBSS. Two weeks following the third vaccination, mice were injected with 5000 C6VL cells and were monitored for survival. C6VL-DC vaccines stimulate both lysate- and tumor-specific survival of mice. A, Groups of 10 mice were vaccinated three times with 5.0 × 105 DC pulsed with lysates prepared from C6VL, irrelevant lymphoma cells, normal lymphocytes, melanoma cells, or kidney tissue. Unpulsed DC vaccines and HBSS were also administered. Two weeks following the third vaccine, mice were challenged with 5000 C6VL cells and were monitored for survival. B, Groups of nine mice received two vaccines of 5.0 × 105 DC pulsed with either C6VL or MBL-2 lysate. Two weeks following the last vaccine, mice were challenged with a lethal number of either C6VL (1000 cells) or MBL-2 (5000 cells) and were monitored for survival. After purification, DCs were resuspended to 1.0 × 106 cells/ml in either CM or AIM-V medium containing lysate from either C6VL T cell lymphoma, MBL-2 (control) T cell lymphoma, B16/F10 melanoma, kidney tissue, or normal primary lymphocytes. The cell lysates were prepared by subjecting 20.0 × 106 cells/ml in CM or AIM-V to three cycles of rapid freezing in liquid nitrogen and thawing at 55°C. The lysates were spun at 5000 rpm to remove particulate cellular debris. The DCs were pulsed with the lysates from three tumor cells per DC for 18 h (25). DC derived in CM were pulsed with lysates of cells cultured in CM, while DC derived in AIM-V were pulsed with lysates of cells cultured in AIM-V. After pulsing, the DC were collected, washed several times in HBSS, and resuspended in HBSS to 5.0 × 106 cells/ml for delivery to mice. Lysate-pulsed DC were injected s.c. in the right flank of the mice biweekly. Mice vaccinated before tumor challenge or for in vitro restimulation studies were immunized one to three times with 1.0 × 106 (Fig. 1⇑) or 5.0 × 105 ( Figs. 2–7⇑⇓⇓⇓⇓⇓) DC. Tumor-bearing mice were given 7.5 × 105 lysate-pulsed DC every 10 days starting 1 day after receiving a lethal number of C6VL tumor cells (Fig. 8⇓). 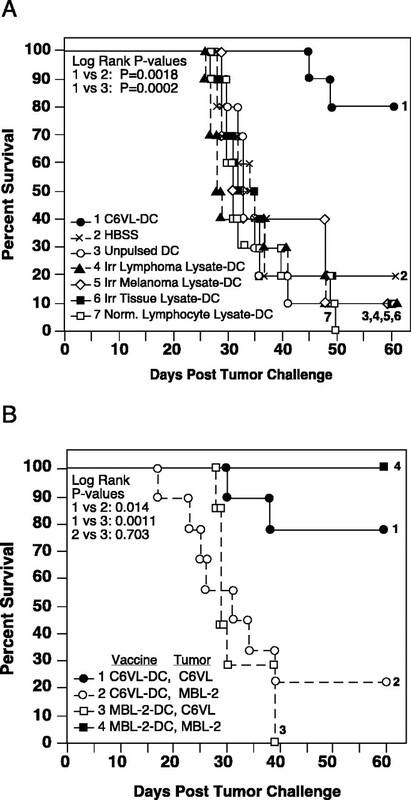 Two and three C6VL lysate-pulsed dendritic cell vaccines provide equal levels of tumor protection. Groups of 10 mice were vaccinated with 5.0 × 105 C6VL-DC (one, two, or three vaccines) or a control vaccine (three vaccines). Two weeks following the last vaccination, the mice were challenged with 5000 C6VL cells and were monitored for survival. DC vaccines stimulate low levels of anti-C6VL Abs. Preimmune (shaded curve) and hyperimmune serum samples from mice vaccinated three times with 5.0 × 105 unpulsed (solid light gray line), C6VL lysate-pulsed DC (solid black line), or MBL-2 lysate-pulsed DC (solid gray line) (A) or TCR Id:KLH (35 μg) with 10 μg QS-21 (solid black line) (B) were used to stain cultured C6VL cells. As a positive control for both panels, an mAb specific for the Vα-chain of the C6VL TCR was added to preimmune serum (dotted gray line). C6VL-bound IgG and IgM were detected using FITC-conjugated goat anti-mouse IgG and IgM secondary mAb. Vaccination with C6VL-DC stimulates tumor-specific proliferation and cytokine release by VPLN cells. Mice were vaccinated twice with 5.0 × 105 C6VL-DC. Lymph nodes were harvested 10 days following the second vaccine and analyzed for their proliferative response (A) and cytokine secretion (B). A, VPLN were stimulated with irradiated C6VL or MBL-2 (control lymphoma) cells at S:R ratios of 1:2, 1:10, and 1:50. Con A (positive control) was titrated from 0.25–0.01 μg/ml. The SI for each sample was calculated as: [(cpm with stimulation − cpm without stimulation)/cpm without stimulation] and is represented as the mean of triplicate samples ± SD. B, VPLN were stimulated with irradiated C6VL, irradiated MBL-2, Con A (positive control), or medium only (negative control). After 96 h, culture media were assayed by sandwich ELISA for IL-4 (data not shown) and IFN-γ secretion. Bars represent the mean of triplicate samples ± SD. Cytokine secretion by irradiated tumor cells was below the limits of detection in all cases. Transfer of T cell-enriched VPLN to naive mice confers protection. Groups of 10 mice (sublethally irradiated) received 5.0 × 106 T cell-enriched lymph node cells from mice vaccinated with C6VL-DC or MBL-2-DC followed by 4 days of IL-2. On day 5 the mice received a lethal number of C6VL cells and were monitored for survival. Groups of 10 mice vaccinated twice with C6VL-DC or HBSS were used as positive and negative controls, respectively. CD8+ T cells are required for tumor protection. Groups of 10 mice were vaccinated twice with 5.0 × 105 C6VL-DC and treated with an isotype-matched irrelevant mAb (SFR8-B6; •), C6VL-DC and treated with a CD8 T cell-depleting mAb (2.43; ○), or MBL-2-DC and treated with an isotype-matched irrelevant mAb (SFR8-B6; X). Two weeks following the last vaccination, mice were challenged with 5000 C6VL cells and were monitored for survival. 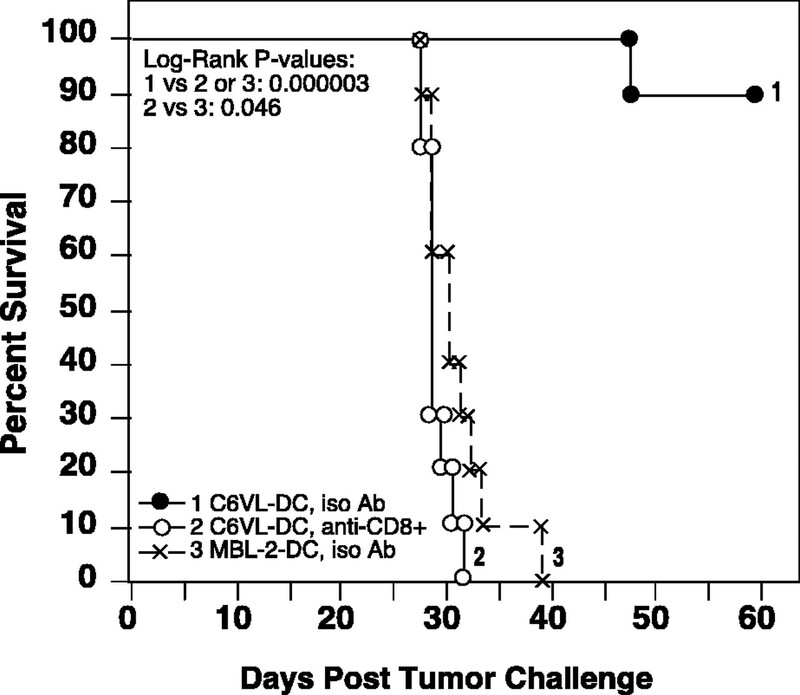 CD8+ T cells were depleted before tumor challenge, and depletion was maintained for 30 days following tumor challenge. Vaccination with C6VL lysate-pulsed DC enhances the survival of tumor-bearing mice. Naive mice were challenged with a lethal dose of C6VL. Twenty-four hours following tumor challenge, mice received their first vaccine of TCR Id:KLH (35 μg/mouse) with QS-21 (10 μg/mouse), C6VL lysate-pulsed DC, or control lysate-pulsed DC (7.5 × 105/mouse). The vaccines continued every 10 days for three vaccines. The mice were monitored for survival for 60 days following tumor challenge. C6VL and MBL-2 tumor cells used for tumor challenges were expanded in vitro and then frozen in aliquots in liquid nitrogen. With the exception of vaccinating tumor-bearing mice, mice were challenged with tumor 14 days following the last vaccination. Two days before tumor challenge, an aliquot of tumor cells was thawed and cultured in CM for 48 h. The cells were collected by centrifugation, washed, and counted using a hemocytometer. The viability of the tumor cells before tumor challenge was generally >98% by trypan blue exclusion. The cells were diluted in HBSS such that a lethal number of tumor cells could be delivered i.p. in 500 μl. The 100% lethal doses for C6VL and MBL-2 were 1000–5000 and 5000 cells, respectively. Groups of 10 mice were used for survival analysis. Survival of tumor-challenged mice was monitored for 60 days following tumor challenge. Survival curves were constructed according to the Kaplan-Meier method. Statistical significance between vaccine groups was determined using the log-rank test and was achieved when p < 0.05. Flow cytometric analysis of C6VL cells stained with hyperimmune serum was used to detect anti-C6VL Abs. Serum samples were obtained before vaccination and 10 days following the third vaccination with 5.0 × 105 unpulsed or lysate-pulsed DC or 35 μg TCR:KLH with QS-21. Serum samples from 10 mice from each experimental group were pooled, diluted 1:10 in PBS to a volume of 50 μl, and incubated in polystyrene tubes with 5.0 × 105 C6VL tumor cells for 30 min on ice. As a positive control, mAb 124-40 was added to preimmune serum at a concentration of 1.0 μg/1.0 × 106 cells. The cells were washed with PBS plus 1% FBS and C6VL-bound IgG and IgM were detected with 1.0 μg/1.0 × 106 cells FITC-conjugated goat anti-mouse IgG+IgM (H+L) Ab. The cells were washed three times with PBS plus 1% FBS, fixed in 200 μl of 2% paraformaldehyde (w/v), and analyzed by flow cytometry using a FACScan (BD Biosciences). Mice were vaccinated s.c. twice with 5.0 × 105 C6VL lysate-pulsed DC, biweekly. Lymph nodes from untreated mice or vaccine-primed lymph nodes (VPLN) were harvested 10 days following the second vaccine, processed gently into single-cell suspensions, and passed through 70-μm pore size nylon mesh filters to remove cell clumps or debris. Triplicate samples of 1.5 × 105 cells in CM were seeded in 96-well, flat-bottom plates. The lymphocytes were stimulated with irradiated C6VL (2500 rad) or MBL-2 (7500 rad) at stimulator:responder (S:R) ratios of 1:2, 1:10, and 1:50. Con A stimulation was used as a positive proliferation control and was titrated from 0.25 to 0.01 μg/ml in triplicate wells. Lymphocytes from untreated mice were used as a negative control. The cells were incubated at 37°C in a humidified incubator for 4 days, with 1 μCi/well [3H]thymidine added for the last 16 h. Cells were harvested onto glass-fiber filters using a FilterMate cell harvester (Packard Bioscience, Meriden, CT) and counted on a scintillation counter (Packard Bioscience). The stimulation index (SI) for each sample was calculated as: [([3H]thymidine incorporation (cpm) with stimulation − cpm without stimulation)/cpm without stimulation] and is represented as the mean of triplicate samples ± SD. Statistics between groups at each S:R ratio were measured at the 95% confidence level using Student’s t test. VPLN cells were collected as described above. VPLN (2.0 × 106) in 1 ml CM were plated in triplicate wells of a 24-well plate with either 1.0 × 106/well irradiated C6VL or irradiated MBL-2, 0.25 μg/ml Con A, or no stimulation (medium only) and incubated at 37°C for 96 h. Wells containing only irradiated C6VL or MBL-2 were assayed to control for cytokine secretion by stimulator cells. Sandwich ELISAs for IL-4 and IFN-γ were performed as described in Caltag’s protocol for cytokine ELISA with modifications. Briefly, rat anti-mouse IFN-γ or rat anti-mouse IL-4 capture Abs at 0.25 μg/ml in 50 mM carbonate (50 μl/well), pH 9.5, was used to coat wells of a 96-well Nunc microtiter plate. After washing, 100 μl of undiluted supernatant from each VPLN restimulation were added to the plates and serially diluted 1:2 over eight wells with PBS with 1% BSA. Wells with known amounts of rIFN-γ or rIL-4 were included on the plates to generate standard curves. Biotinylated second-stage rat Abs against either IL-4 or IFN-γ were used to detect bound cytokine. Streptavidin-HRP was used to detect bound second-stage Ab. The peroxidase reaction was performed in a solution containing 50 mM sodium citrate (pH 4.0), 150 μg/ml ABTS, and 0.01% H2O2. OD405–450 was measured on a Vmax Microplate Reader (Molecular Devices, Menlo Park, CA). Data are represented as the average of triplicate samples ± SD. Statistics between groups were measured using Student’s t test. Statistical significance was reached at p < 0.05. CD8+ T cells were depleted in vaccinated mice using anti-CD8.2 mAb 2.43. Mice were injected i.p. with 0.5 ml HBSS containing 250 μg of the mAb on days 6, 5, and 4 before tumor challenge and with four weekly injections thereafter. Nondepleted mice received the isotype-matched control mAb SFR8-B6 on the same schedule. The level of CD8+ T cell depletion and the maintenance of depletion were assessed by flow cytometry using a non-cross-blocking anti-CD8 mAb, 53-5.8. The analysis was performed on PBL, splenocytes, and lymph node cells 1 day before tumor challenge and on splenocytes and lymph node cells 1 day before each of the four weekly injections following tumor challenge. Groups of 15 donor mice were vaccinated twice with C6VL lysate-pulsed DC or the control vaccine, MBL-2 lysate-pulsed DC. The DC vaccination consisted of 2.5 × 105 DC injected s.c. in the right flank and 1.25 × 105 DC injected in each hind footpad. Nine days after the last immunization, donor mice were sacrificed, and VPLN (right inguinal and both popliteal) were harvested. The lymphocytes were processed gently into single-cell suspensions and passed through 70-μm pore size nylon mesh filters to remove cell clumps and debris. B cells were depleted using a nylon wool column. The B cell-depleted lymphocytes were washed twice with HBSS. Lymphocytes were analyzed pre- and post-nylon wool depletion to determine B and T cell composition, as determined by CD3+ and CD19+ populations. Five million T cell-enriched VPLN in 200 μl HBSS were injected i.v. into groups of 10 naive recipients that were exposed to a sublethal dose of whole-body gamma irradiation (400 rad) 1 day previously. Immediately after injection, 3.0 × 104 U of human rIL-2 in 200 μl HBSS were injected i.p. into each recipient and control mouse. IL-2 injections continued every 12 h for 4 days (eight total doses) (38). One day following the last IL-2 injection, mice were challenged with a lethal dose of C6VL tumor and followed for survival. Prior experiments have shown that C6VL TCR Id protein vaccines are able to stimulate a protective immune response. To determine whether lysate-pulsed DC vaccines were also effective in stimulating anti-tumor immunity against C6VL, groups of 10 mice were vaccinated three times with either 1.0 × 106 C6VL lysate-pulsed DC (C6VL-DC) or TCR Id:KLH+QS-21. Unpulsed DC and HBSS vaccines were administered to groups of mice as controls. Fourteen days following the third vaccine, mice received a lethal dose of C6VL and were monitored for survival. C6VL-DC vaccines stimulated high levels of anti-tumor immunity in vaccinated mice, resulting in 100% survival of the mice (Fig. 1⇑). The protection generated by C6VL-DC vaccines was superior to the response generated by TCR Id protein vaccines (p = 0.0042). TCR Id:KLH+QS-21 vaccination did, however, still significantly enhance the survival of tumor-challenged mice compared with HBSS controls (p < 0.0001) as was previously reported (11). The survival of C6VL-DC recipients was significantly increased compared with recipients of unpulsed DC (p<0.0001), which did not enhance the survival of mice compared with HBSS injections (p = 0.214). To determine whether the anti-C6VL tumor protection conferred by DC vaccines was lysate specific, groups of 10 mice were vaccinated three times with 5.0 × 105 C6VL-DC or control lysate-pulsed DC. Control lysates were prepared from an irrelevant T cell lymphoma (MBL-2), an irrelevant tumor (B16/F10 melanoma), normal lymphocytes, or irrelevant tissue (kidney). Unpulsed DC vaccines and HBSS injections were included as negative controls (Fig. 2⇑A). Mice were challenged with a lethal dose of C6VL 14 days following the third vaccine. C6VL-DC stimulated high levels of protection compared with unpulsed DC (p = 0.0002) or HBSS injection (p = 0.0018). DC pulsed with control tumor or tissue lysates did not stimulate a protective immune response against C6VL, and survival was indistinguishable among the groups (p > 0.6). The lysate specificity of the tumor protection was further evaluated in a cross-challenge experiment. Groups of 20 mice were vaccinated twice with 5.0 × 105 C6VL-DC or MBL-2-DC. Two weeks following the last vaccine, 10 of the mice from each vaccine group were injected with a lethal dose of C6VL, while the other 10 were injected with a lethal dose of MBL-2. C6VL-DC protected eight of 10 mice challenged with C6VL. When C6VL-DC vaccine recipients were challenged with MBL-2, the survival of the mice was significantly reduced compared with that of C6VL-challenged mice (p = 0.014; Fig. 2⇑B). Similarly, MBL-2-DC-vaccinated mice were poorly protected against C6VL as opposed to MBL-2 challenge (p<0.001; Fig. 2⇑B). The lack of C6VL protection by MBL-2-DC vaccines was not due to a lack of an immune response stimulated by the vaccine, as MBL-2-DC vaccination protected 100% of mice that were lethally challenged with MBL-2 (Fig. 2⇑B). Three immunizations with 5.0 × 105 C6VL-DC resulted in nearly all the mice surviving a lethal inoculation of tumor cells (Fig. 2⇑A). We sought to determine whether we could use fewer injections of C6VL-DC and still protect the immunized mice (Fig. 3⇑). Groups of 10 mice were vaccinated with 5.0 × 105 C6VL-DC one, two, or three times before tumor challenge with C6VL. Mice immunized with three vaccines of 5.0 × 105 MBL-2-DC were included as a control group. 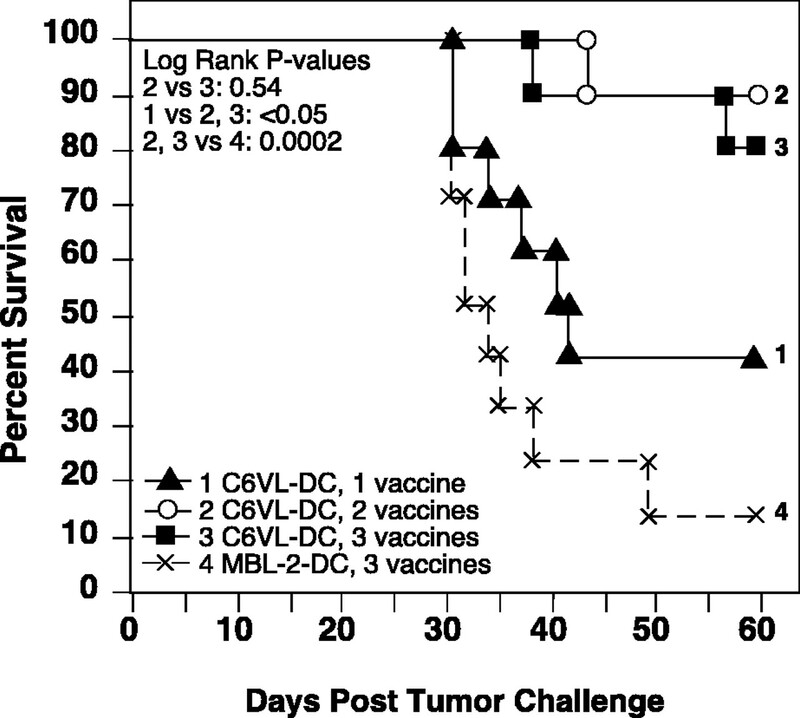 Two and three vaccines of 5.0 × 105 C6VL-DC stimulated equal levels of protection against lethal tumor challenge (p = 0.54), which was significantly different from the control vaccine (p = 0.0002). C6VL-DC given once before tumor challenge stimulated intermediate levels of survival (40%) that were significantly lower than those observed in the two- or three-vaccine groups (p < 0.05). As reported previously, TCR Id:KLH+QS-21 vaccines stimulate high titers of anti-C6VL TCR Id-specific Abs (10, 11). To assess whether C6VL-DC vaccines stimulated C6VL-specific Ab production, hyperimmune serum from vaccinated mice was used to stain C6VL cells (Fig. 4⇑). Mice were vaccinated three times with 5.0 × 105 C6VL-DC, MBL-2-DC, or unpulsed DC (Fig. 4⇑A). Mice were also vaccinated with TCR Id:KLH+QS-21 as a positive control for C6VL-specific Ab production (Fig. 4⇑B). Preimmune sera were obtained before the first vaccination, and hyperimmune sera from 10 mice/group were collected and pooled 10 days following the third vaccine. Preimmune serum spiked with anti-C6VL TCR Vα mAb 124-40 was used as a positive control for C6VL staining. Three injections of TCR Id:KLH+QS-21 stimulated a high titer of anti-C6VL Abs. Hyperimmune serum from mice vaccinated with C6VL-DC had only a small amount of Abs that bound to C6VL compared with preimmune serum staining (mean log fluorescence (MLF), 6.69 compared with 3.48). The same modest increase in C6VL staining was observed with the hyperimmune serum from mice vaccinated with unpulsed DC (MLF 11.11) and MBL-2-DC (MLF 5.52). An ELISA using plate-bound protein from C6VL lysate also showed low amounts of nonspecific Ab binding to C6VL proteins (data not shown). To characterize the cellular immune response generated by C6VL-DC vaccines, VPLN were harvested from mice and a standard cell proliferation assay was performed (Fig. 5⇑A). VPLN from mice vaccinated twice with 5.0 × 105 C6VL-DC were stimulated in vitro with either irradiated C6VL or MBL-2 control T cell lymphoma cells. Background proliferation values for each stimulation group were determined for triplicate wells containing responder cells only. Naive lymphocytes were stimulated with irradiated C6VL as a negative proliferation control. Con A stimulation of VPLN cells was included as a positive proliferation control. Stimulation of VPLN cells with irradiated C6VL tumor cells resulted in high levels of proliferation at each S:R ratio. The SI were 12.5 ± 1.7, 8.75 ± 0.61, and 5.53 ± 0.87 for ratios of 1:2, 1:10, and 1:50, respectively. Stimulation of vaccine-primed cells with MBL-2 resulted in moderate levels of proliferation (SI of 4.27 ± 0.26, 3.69 ± 0.73, and 2.16 ± 0.19 for ratios of 1:2, 1:10, and 1:50, respectively) that were not statistically different from the negative control (p = 0.67, 0.08, and 0.07 for ratios of 1:2, 1:10, and 1:50, respectively). Stimulation of VPLN cells with irradiated C6VL resulted in significantly higher levels of proliferation than were observed upon stimulation with MBL-2 (p = 0.0041, <0.0001, and 0.020 for ratios of 1:2, 1:10, and 1:50, respectively). No proliferation of irradiated tumor cells was detected. Cytokine ELISAs were used to measure cytokine secretion by VPLN stimulated by C6VL. Triplicate samples of VPLN cells from mice vaccinated twice with 5.0 × 105 C6VL-DC were stimulated in vitro with irradiated C6VL or MBL-2 cells at a ratio of two VPLN cells to one irradiated tumor cell. Con A stimulation was included as a positive control for IFN-γ secretion. Unstimulated VPLN cells served as a negative control. Irradiated tumor cells were incubated without responder cells to control for stimulator cell cytokine secretion. Stimulation of VPLN with irradiated C6VL resulted in high levels of IFN-γ secretion (66.7 ± 5.4 ng/ml) compared with stimulation with MBL-2 (21.4 ± 3.4 ng/ml; p = 0.022). IL-4 was also specifically secreted by VPLN upon ex vivo stimulation with irradiated C6VL (<1 ng/ml), although at levels ∼80-fold lower than IFN-γ (data not shown). Stimulation of VPLN cells with irradiated MBL-2 cells resulted in IFN-γ secretion not statistically different from that observed in the unstimulated VPLN cultures (p = 0.11) and did not result in secretion of IL-4 above the limit of detection of the ELISA (0.11 ng/ml; data not shown). Irradiated tumor cells incubated without responder cells did not secrete measurable levels of IFN-γ or IL-4. The importance of the T cell-mediated immune response in protection against C6VL tumor in vivo was determined by two different approaches. An adoptive transfer experiment was performed (Fig. 6⇑) to determine whether tumor protection against C6VL could be solely conferred by immune T lymphocytes. VPLN were harvested from donor mice vaccinated twice with 5.0 × 105 C6VL-DC. This cell population contained 38% CD19+ B cells and 49% CD3+ T cells as determined by flow cytometry (data not shown). After depleting B cells with a nylon wool column, the cells were >95% T cells (data not shown). Five million T cell-enriched VPLN were transferred i.v. into sublethally irradiated naive recipient mice. Negative control mice were injected with 5.0 × 106 of similarly treated vaccine-primed lymphocytes from MBL-2-DC-vaccinated donor mice. Groups of 10 mice that were injected with C6VL-DC or HBSS but were not transferred served as positive and negative vaccine controls, respectively. All recipient and control mice received 30,000 U of recombinant human IL-2 beginning immediately after the transfer continuing every 12 h for eight total injections, based on reports that IL-2 induces the proliferation of the transferred cells and prolongs their survival in vivo (38). Four days after transfer, lymphocytes were isolated from one mouse from each group and used in a proliferation assay. The proliferative responses to irradiated C6VL or MBL-2 stimulation observed in transfer recipients were less than one-half the responses in representative mice vaccinated directly with C6VL-DC or MBL-2-DC (data not shown). Five days following transfer or 1 day after the IL-2 injections were completed, mice were challenged with a lethal dose of C6VL tumor (Fig. 6⇑). Recipient mice that received immune lymphocytes from C6VL-DC were protected from C6VL challenge at a level near that in the positive control mice (p = 0.22), demonstrating that the protective immunity could be transferred with 5.0 × 106 vaccine-primed lymphocytes. Recipient mice that received immune lymphocytes from MBL-2-DC were not protected from C6VL challenge compared with recipients of C6VL-DC-primed lymphocytes (p = 0.00043), as their survival was equivalent to that of HBSS-injected control mice (p = 0.71). The role of CD8+ effector cells in mediating protective anti-tumor immunity was assessed by depleting CD8+ T cells in C6VL-DC-immunized mice with an anti-CD8 mAb (Fig. 7⇑). Mice were immunized twice with 5.0 × 105 lysate-pulsed DC and then treated with either an anti-CD8 mAb or an isotype-matched control mAb. CD8+ cells were depleted (>98%) in peripheral blood, spleen, and lymph nodes, and the depletion was maintained for 30 days after tumor challenge. 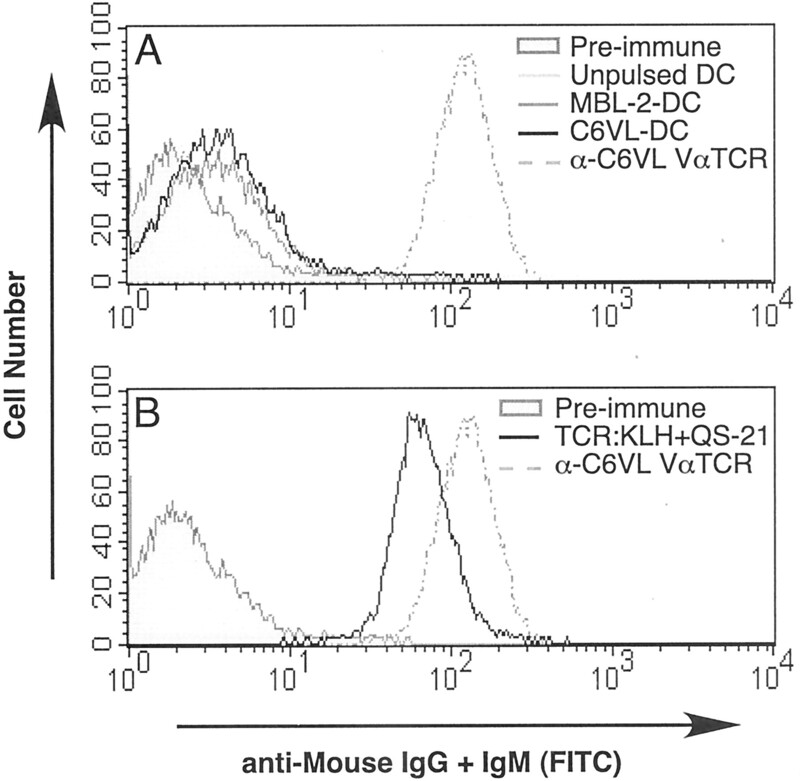 The isotype-matched irrelevant mAb had no effect on the CD8+ T cell population of mice. Mice vaccinated with C6VL-DC that were not depleted of CD8+ T cells were highly protected from a C6VL challenge compared with mice vaccinated with MBL-2-DC (p = 0.000003). Depletion of CD8+ T cells completely abrogated tumor protection in mice vaccinated with C6VL-DC (p = 0.000003). To determine whether C6VL-DC vaccines were effective in treating pre-existing C6VL tumors, groups of 10 unvaccinated mice were challenged with a lethal dose of C6VL and immunized for the first time 1 day thereafter. The mice were vaccinated with 7.5 × 105 C6VL-DC, MBL-2-DC, or TCR Id:KLH + QS-21 every 10 days for three immunizations. 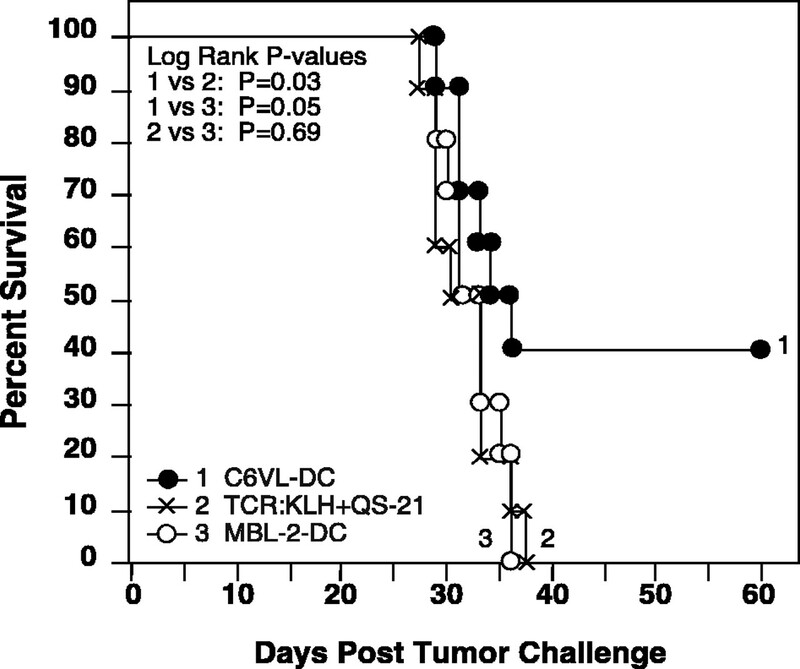 C6VL-DC vaccines significantly enhanced the survival of tumor-bearing mice compared + mice vaccinated with MBL-2-DC (p = 0.05) or TCR Id:KLH + QS-21 (p = 0.03), with 40% of the tumor-challenged mice surviving (Fig. 8⇑). TCR Id protein vaccine recipients were not protected from existing C6VL tumor. Tumor-derived TCR Id protein is a tumor-specific Ag that has been successfully exploited in the development of active immunotherapy protocols against defined epitopes of the murine T cell lymphoma, C6VL (10). Vaccination with TCR Id:KLH+QS-21 conferred significant levels of protection from an otherwise lethal tumor challenge (11). Mechanistically, TCR Id vaccines promoted both cellular and humoral immune responses when they were administered with the chemical adjuvant QS-21. Despite stimulating high levels of TCR Id-specific Ab production, the presence of Abs in hyperimmune serum did not correlate with tumor protection in vaccinated mice. CD8+ T cells were absolutely required for tumor protection (11). 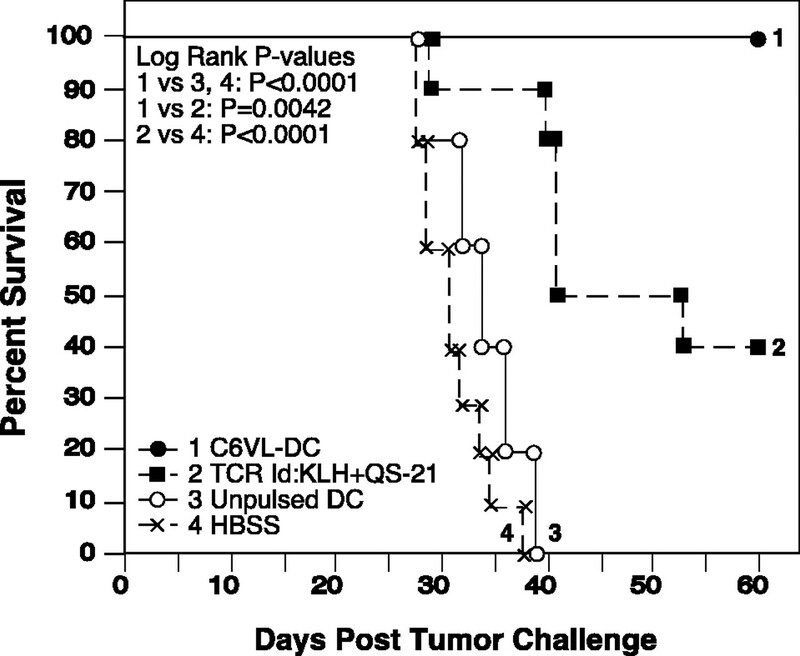 Although vaccination with TCR Id:KLH in QS-21 enhanced the survival of mice against a subsequent tumor challenge, it was not effective therapeutically in tumor-bearing mice (Fig. 8⇑). We hypothesized that a vaccine designed to stimulate potent cell-mediated responses against a broader array of tumor Ags would be more efficacious. DC are widely known to be potent inducers of CD4+ and CD8+ T cell-mediated responses against tumor cells (14). In addition, evidence suggests that vaccination with a mixture of Ags may yield enhanced anti-tumor immunity as well as decrease the possibility of tumor escaping the immune response (30, 32). The generation of a vaccine for T cell lymphoma consisting of multiple known epitopes is currently limited due to the lack of well-characterized, tumor-specific Ags. However, loading DC with tumor RNA, DNA, or cell lysates allows a similar effect without necessitating the discovery of each Ag. In this study we directly compare the abilities of TCR Id:KLH+QS-21 and tumor lysate-pulsed DC vaccines to stimulate protective immunity against the murine T cell lymphoma, C6VL. We report that vaccination of mice with C6VL lysate-pulsed DC stimulates potent anti-tumor protection that surpasses immunity stimulated by TCR Id:KLH+QS-21 vaccines (Fig. 1⇑). Our goal in using C6VL lysate-pulsed DC to stimulate anti-tumor immunity was to have a broader array of tumor-specific Ags at which to target an immune response. However, a point that cannot be overlooked is that tumor lysates contain self-Ags as well as tumor-specific Ags. The benefits of using whole tumor cell lysates as Ag sources for loading DC have been demonstrated in many cases without the development of autoimmune responses toward self-Ags (25, 39). Recently, Vierboom et al. (40) demonstrated that expression of some self Ags can serve as targets for CTL-mediated destruction without demonstrable damage to normal tissues. Notwithstanding, skin depigmentation (41), autoimmune diabetes, and myocarditis (42) have been induced in mice vaccinated with tissue-specific Ags. C6VL is a CD4+ T cell malignancy. Therefore, we were particularly interested in whether lymphocyte populations were depleted in our immunized mice. Based on our data, C6VL-DC vaccines did not promote the development of autoreactivity against self-CD4+ T cells or other immune cell populations in the spleen, lymph nodes, or peripheral blood (data not shown). 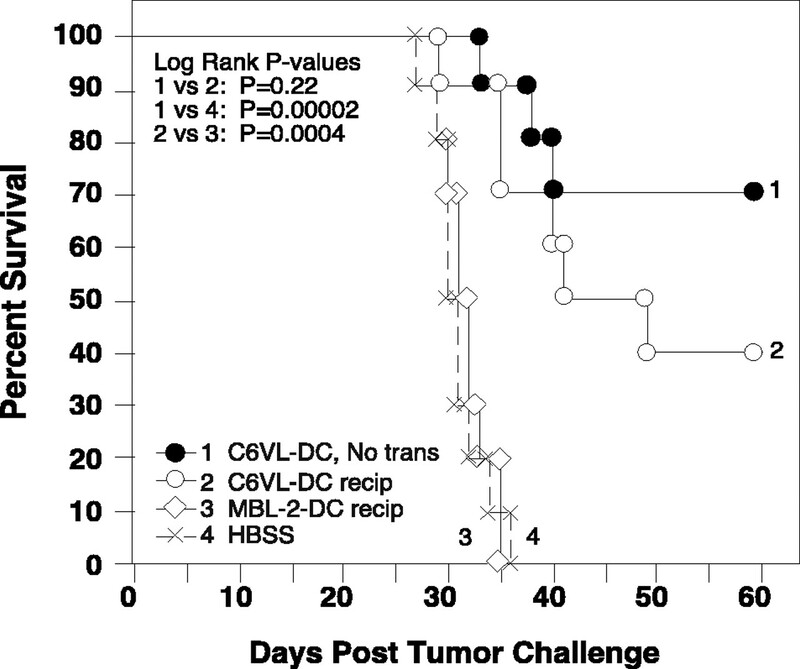 Immunizations with C6VL-DC vaccines stimulated lysate-specific survival in vivo (Fig. 2⇑). Injections of DC pulsed with melanoma lysate, normal lymphocyte lysate, or kidney tissue lysate did not protect mice from C6VL challenge, indicating that C6VL lysate contains antigenic epitopes capable of stimulating C6VL protection that are not highly expressed in nonmalignant tissues or by all malignancies. Vaccination of mice with DC pulsed with lysates prepared from the control T cell lymphoma line, MBL-2, did not protect mice against tumor challenge. Thus, the Ags stimulating protective anti-tumor immunity against C6VL are not shared by all T cell lymphoma tumors. Indeed, mice vaccinated with MBL-2 lysate-pulsed DC were protected against subsequent MBL-2 tumor challenge, but not against C6VL challenge (Fig. 3⇑B), demonstrating that tumor lysate-pulsed DC vaccines could be efficacious in stimulating lysate-specific, anti-tumor responses in other T cell lymphomas as well. Similar findings have been reported for the use of primary multiple myeloma (33) and B cell chronic lymphocytic leukemia (34) lysate-pulsed DC to stimulate patient CTL activity against autologous tumors in vitro. In these studies primary tumor lysate-pulsed DC stimulated CTL activity against autologous malignant cells, but not against autologous nonmalignant cells and rarely against allogeneic tumor cells. Collectively, these data argue that lymphoma lysate-pulsed DC as therapeutics would require the preparation of vaccines on a per-patient basis. The finding that 100% of the mice vaccinated three times with 1.0 × 106 lysate-pulsed DC survived subsequent tumor challenge was surprising (Fig. 1⇑). Vaccinating mice with DC derived and loaded with Ag under serum-free conditions ensured that protection from tumor challenge was not due to an immune response generated against FBS proteins on C6VL cells cultured in serum-containing media (Figs. 2⇑A, 3, 4, and 6–8). Decreasing the number of C6VL-DC delivered to mice to 5.0 × 105 for three vaccines did not result in a significant decline in tumor protection (Fig. 2⇑A). Furthermore, two vaccines of 5.0 × 105 C6VL-DC stimulated levels of tumor protection equal to three vaccines (Fig. 3⇑), demonstrating that we could be even less aggressive in our vaccination protocol. Based on these data, we modified our vaccination protocol to two vaccines of 5.0 × 105 DC for the experiments depicted in Figs. 2⇑B and 5–7. The delivery of one C6VL-DC vaccine before tumor challenge generated levels of protection similar to those observed when three TCR Id:KLH+QS-21 vaccines were delivered. Whether this result is indicative of an enhanced ability of DC to prime immune responses compared with TCR Id or of a broader immune response generated against multiple or more potent Ags is unclear, and further work is being performed to examine this question. C6VL-DC vaccines did not stimulate strong humoral immune responses against C6VL (Fig. 4⇑A). Further, Ab production did not correlate with the protective ability of the C6VL-DC vaccine. Instead, our data demonstrate that a Th1-type cellular immune response is required to mediate C6VL-DC-induced tumor protection. The cellular response was characterized ex vivo by high levels of tumor-specific proliferation (Fig. 5⇑A) and IFN-γ release (Fig. 5⇑B) by VPLN. In vivo, we demonstrated that adoptively transferred immune T cells were sufficient to protect naive mice from tumor challenge (Fig. 6⇑), and that the effector mechanism stimulated by C6VL-DC vaccines was dependent upon CD8+ T cells (Fig. 7⇑). Additional studies indicated that NK cells do not contribute to the effector mechanism generated by C6VL-DC. NK cells were not activated in the spleens or lymph nodes of C6VL-DC recipients, and the survival of vaccinated mice was not influenced by the depletion of NK1.1+ cells before C6VL challenge (data not shown). The role of CD4+ T cells in the anti-tumor immunity generated by C6VL-DC vaccines was not tested in our experiments, as anti-CD4 Abs would also deplete C6VL cells used for tumor challenge. Immunotherapeutic approaches for T cell lymphoma are likely to be most effective for the clearance of minimal residual disease in patients following conventional therapies. To more closely model the clinical situation of a patient with minimal residual disease, we determined the efficacy of the C6VL-DC vaccine in mice already carrying a lethal number of C6VL cells. Naive mice or recipients of control vaccines succumb to lethal dose C6VL challenge in ∼30 days. Despite the aggressive nature of C6VL growth, C6VL-DC vaccines were able to stimulate a protective immune response quickly enough to significantly enhance the survival of tumor-bearing mice (Fig. 8⇑). These data indicate that lysate-pulsed DC vaccines may have clinically relevant therapeutic potential in patients with pre-existing disease. Future experiments using this vaccine protocol will focus on the use of cytokine adjuvants to enhance the anti-tumor activity of C6VL-DC vaccines in the setting of pre-existing T cell lymphoma. Collectively, C6VL-DC vaccines have proven to stimulate immune responses superior in their potential to prevent future tumor growth and clear existing C6VL T cell lymphoma compared with previously reported TCR Id protein and TCR Id adenoviral vaccines. The studies presented herein provide evidence that vaccination with T cell lymphoma lysate-pulsed DC may allow enhanced efficacy in the clinical treatment of T cell malignancies and result in increased disease-free survival rates of patients without necessitating the identification of tumor-specific Ags or patient-specific Id protein expression. We thank A. Chang for helpful suggestions regarding the in vitro proliferation assay and adoptive transfer experiments. ↵1 This work was supported in part by the Office of Research and Development, Medical Research Service, Department of Veterans Affairs, and a G&P Medical Research Award. E.G. was supported by National Institute of Allergy and Infectious Diseases Training Grant T32AI07413 and National Cancer Institute Training Grant T32CA88784. ↵3 Abbreviations used in this paper: KLH, keyhole limpet hemocyanin; CM, complete medium; DC, dendritic cells; C6VL-DC, C6VL lysate-pulsed DC; MAC, metal affinity column; MBL-2-DC, MBL-2 lysate-pulsed DC; MLF, mean log fluorescence; SI, stimulation index; S:R ratio, stimulator:responder ratio; TCR Id:KLH+QS-21, TCR Id conjugated to keyhole limpet hemocyanin and mixed with QS-21; VPLN, vaccine-primed lymph nodes.